September 15, 2016 (Washington, DC, USA) - President of the Federated States of Micronesia (FSM) Peter Christian delivered remarks to a high-level audience during the first day of the 3rd Our Ocean conference, hosted by United States Secretary of State John Kerry. The purpose of the annual Our Ocean conference is to catalyze actions to protect our shared ocean resources and empower a new generation to lead the way toward a healthy and sustainable ocean. 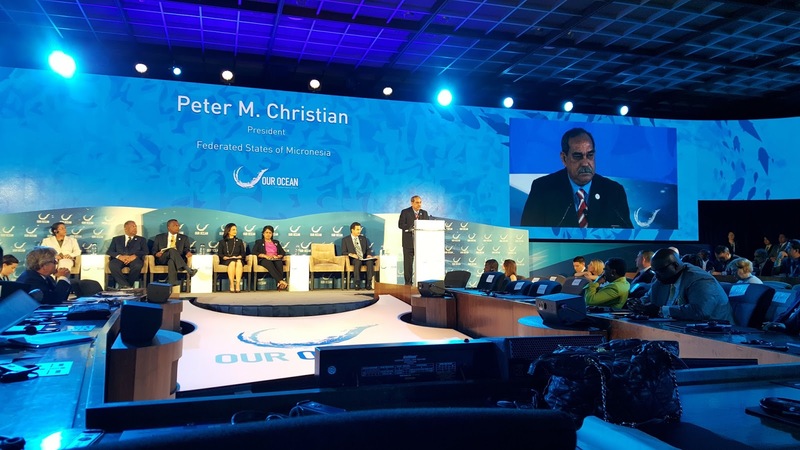 The President was the first to speak on the panel entitled Global Ocean Leadership, which also included Mauritius Prime Minister Ameenah Gurib-Fakim and four Vice Presidents and Foreign Ministers. He set the scene by relating the outcomes of the 47th Pacific Island Forum (PIF) Leaders’ Meeting held in Pohnpei last week, including the Forum Communiqué, which contains an Annex entitled the Pohnpei Ocean Statement: A Course to Sustainability. This statement emphasizes the centrality of oceans for Pacific peoples and livelihoods, and it highlights the importance of achieving the targets under Sustainable Development Goal 14 to secure the health and productivity of the oceans and the wellbeing of future generations. As current Chair of the Forum, he also reiterated his welcome to the newest full members of the Forum, French Polynesia and New Caledonia. For audience members at the Our Ocean conference who were unfamiliar with the FSM, the President said in jest that one way to get to there would be to board a flight from Hawaii to Sydney and, about 8 hours into the flight, jump out of the right side of the plane and land right in Micronesia. Further to the FSM’s geography, he said that the land mass of the islands is small, but the area of ocean that the FSM governs is vast enough to comfortably fit the entire United States. He reflected on how fishing practices in FSM waters have changed with the advent of new technologies, especially those that allow fish to be frozen and stored. This has not only caused stress on coastal resources and biodiversity, but, in some cases, it has also diminished neighborly relations, which were once generous with respect to sharing daily catch. President Christian concluded his remarks with an emphasis on the connection between climate change and ocean health. In this regard, he thanked representatives of the global community for their support to successfully adopt the Paris Climate Agreement, which the FSM officially ratified on September 15, 2016, in advance of the September 21 United Nations (UN) Secretary General’s high-level event on accelerating the Agreement’s entry into force. Throughout both days of the Our Ocean conference, an important aspect was the contribution of specific commitments to protect the ocean by many participants, including States, non-governmental organizations, scientific entities and foundations. Between sessions, many representatives of these States and organizations briefly took the floor to verbally announce their commitments. The list of commitments and programs can be found on the Our Ocean website. 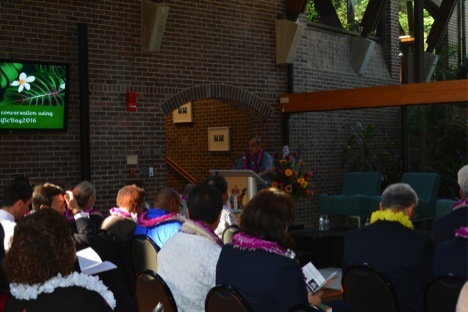 On September 14, the evening before the Our Ocean conference commenced, President Christian also delivered remarks at Pacific Day, an event hosted annually by the Pacific embassies in Washington, DC and held at the New Zealand Embassy to the United States. In his remarks entitled “Small Islands, Big Ocean”, he placed a strong emphasis on climate change, referring to it as a “titanic challenge”, and calling on global leaders to stop resisting the science and do the right thing for planet Earth. He also related the key outcomes of the 47th PIF Leaders’ Meeting and highlighted the recent designation of Nan Madol as a World Heritage site by the UN Educational, Scientific and Cultural Organization (UNESCO). President Peter Christian delivers remarks entitled “Small Islands, Big Ocean” at Pacific Day at the Embassy of New Zealand in Washington, DC. The President’s delegation to Washington, DC, included FSM Secretary of Foreign Affairs Lorin Robert, Secretary of Resources and Development Marion Henry, Secretary of Justice Joses Gallen, Director of Office of Environment and Emergency Management (OEEM) Andrew Yatilman, Executive Director of the National Oceanic Resources Management Authority (NORMA) Eugene Pangelinan, and the President’s Chief of Staff Leo Falcam, Jr.